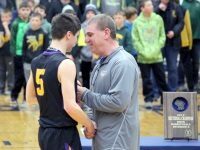 DENMARK – It might be easy for Jack Satori’s performance on Friday night against Little Chute to get buried under the gaudy numbers Pat Suemnick and Zane Short amassed. Suemnick, after all, erupted for 25 points, 10 rebounds and seven … that’s right, seven … blocked shots, while Short scored 22 points in the second half alone, and finished with 28. Satori meanwhile? Four points, four rebounds, four assists. 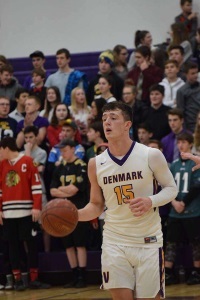 It would be easy to underestimate — but, in reality, hard to overestimate — the role the hard-nosed defensive specialist played in Denmark High School’s critical 67-63 win over Little Chute in Denmark, a win that kept the Vikings atop the North Eastern Conference standings at 8-2, tied with Wrightstown and Freedom. Mueller, who came in averaging 17 points, finished with only 10. Only five of those came on Satori’s watch. One bucket was off a steal and fast break, and a three-pointer later in the game was the result of an offensive rebound and kickout. “He’s a great player,” Satori said of Mueller. “He hits from beyond the arc; he can drive. So, I just try to deny him the ball. It’s definitely physically challenging. I try my hardest in practice, like it’s a game-day scenario, so I don’t get tired. One of those whatevers came when Satori dove on the floor to force a turnover in the final minute and the game in the balance. Suemnick, who collected his seventh 20-point game of the season, recognized Satori’s vital contributions. Even with Satori’s efforts, though, this win might not have been possible without Suemnick’s all-round, game-long effort or Short’s second-half bounce-back after a shaky first half. The second-leading scorer in the league at more than 22 a game, Short was held to six before intermission. He and Suemnick accounted for 36 of the Vikings’ 40 second-half points, Short on a variety of individual moves to the bucket as well a couple of big three-pointers. Neither team could ever seize control of this one. Denmark’s largest lead was eight; Little Chute’s just five in the early minutes of the contest. There were seven ties and 11 lead changes. The teams went into the locker room all even at 27, and once Short drained a pair of free throws in the opening minutes of the second half, Denmark led for the next eight minutes, eventually building a 44-36 advantage when Short snagged a steal, took the ball behind his back and laid it in with 11:06 remaining. 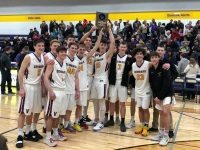 But Little Chute scored nine straight on an old-fashioned three-point play and back-to-back bombs from Justin Job, and the Vikings trailed, 47-46. The Mustangs’ final lead came on a free throw with 3:46 remaining, but Short gave Denmark the lead for good 40 seconds later on a spinning bank from four feet that put the Vikings up 57-56. He followed that with a driving layup before a stickback basket had Little Chute within 59-58 with just 2:19 remaining. With a minute remining, Suemnick was able to grab an offensive rebound and kick it out to Satori, who whipped it back inside for a Suemnick basket and a 61-58 lead. Denmark forced three turnovers and a missed three over the next 45 seconds and when Suemnick slammed one home off a Short feed, the victory was all but sealed at 65-58 with 12 seconds left. 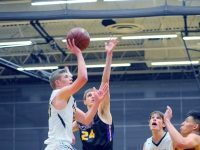 Suemnick had been held to eight and 11 points in two of his previous three games, but he took full advantage of his size on both ends against Little Chute. Added Stelmach: “The last few teams have been very physical with him and Little Chute was, too. But it was good to see him be so effective on the offensive end because we needed every point that he scored tonight. Suemnick said his overall increase in strength and better timing have accounted for his whopping block totals, which with, unofficially, seven more on Friday brought his season total to 36. Zach Gezella added four points, four rebounds and two assists, while Brennen Miller had five rebounds and three assists. Short also grabbed five boards, two steals and dished out three assists. 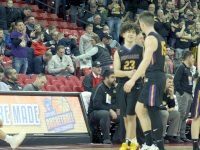 Brady Jens, one of the returning core-four for Denmark and a scintillating point guard, is still finding his game legs after missing 11 games with an ankle injury. He played sparingly against the Mustangs, knocking down a three-pointer. The Vikings finished, unofficially, 24 of 47 from the field, 3 of 13 from deep. Little Chute connected on 26 of 49 shots, 6 of 19 from beyond the arc. Each team had 15 turnovers, though Denmark had only five after intermission. 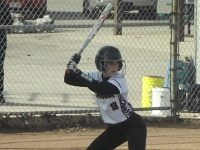 Denmark travels to Fox Valley Lutheran on Tuesday.